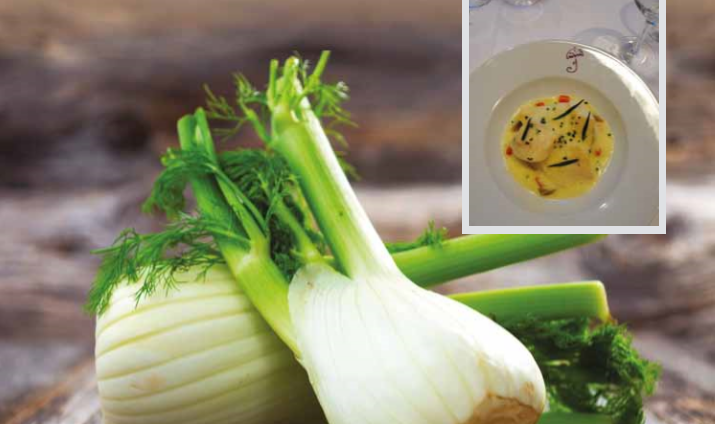 The recipe has been served onboard Oceania Cruises at the well-known restaurant, Jacques. Remove the outer leaves of the fennel and cut in quarters. Place in a roasting pan and reserve. Sweat the carrots and shallots in a large amount of extra virgin olive oil without allowing them to colour. Add salt, water, lemon juice and lemon zest. Bring to the boil, then remove from the heat and pour over the fennel. Cover tightly with 2 sheets of aluminum foil and bake for 1 hour at 170°C. Remove from the oven and allow the fennel to cool in the juice. Remove the fennel, carrot and shallot and set aside, reserving the juice. Take 300g of the fennel braising juice making sure to include all the olive oil. Add the saffron and bring to the boil. Keep the remaining juice (without olive oil) for cooking the fish. Place the braised fennel with carrot and shallot in a casserole and add one ladle of the reserved cooking juice. Add the John Dory filets and green olives. Cover and simmer for 2 minutes, keeping the John Dory translucent. Carefully spoon 2 pieces of fennel on the bottom of the plate and top with the fish fillet. Add the sauce. Meanwhile warm and blend the fennel juice, making sure you have enough olive oil to foam. Add a piece of butter and keep mixing to get foam. Spoon the foam over the dish.